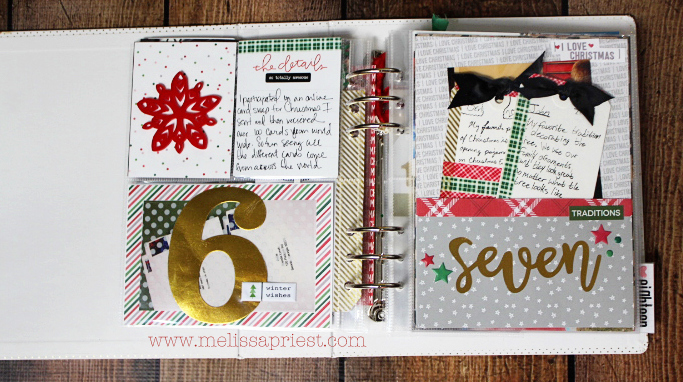 I wanted to share with you my 2016 December Daily Album - yes, its taken my 10 months to get it finished and photographed. Better late than never, yes? I did my December Daily album from December 1 - December 31, so I will be breaking up this reveal into two posts. 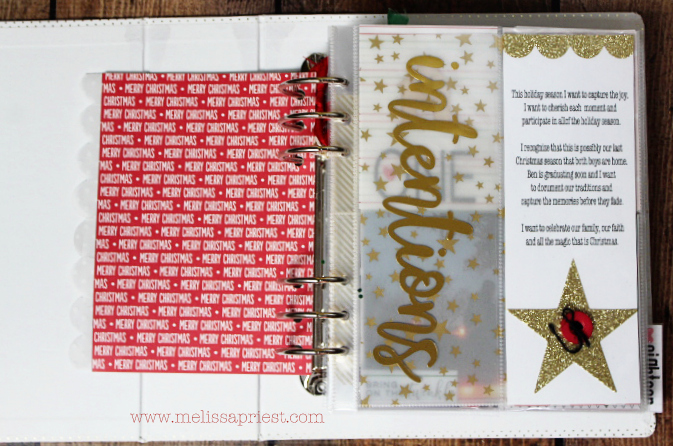 Post #1 will be my cover, my intentions page, and days 1-12. Post #2 will be days 13-31. You can find that post here. 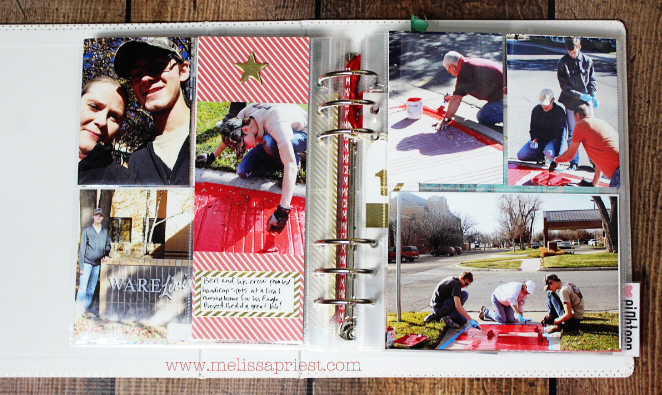 For this project, I used a variety of supplies - all from different sources. I have tried to include all my sources - if I knew them - as I made this post. Please note - I did not buy everything brand new when I started this project. 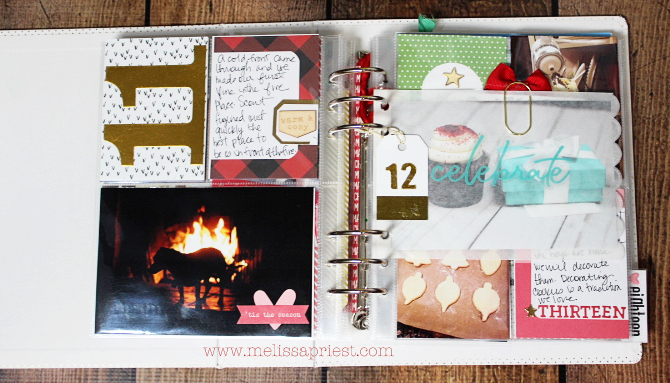 I had collected many of the items through out the year knowing I would be making a December Daily book. Some of the supplies I used are from several years ago. Please don't be overwhelmed with all the supplies. Use what you have. Thats what I did. 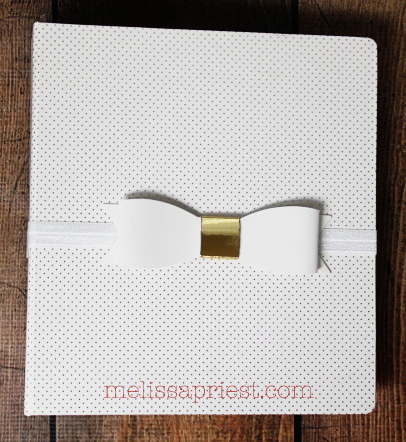 Cover - For my album, I used an Ali Edwards Gold Polka Dot Album. I seriously love this album. In the past, I have had trouble keeping my album shut, so this year I made a band to stretch around it using a pre-made gift wrap bow that I hot glued to a piece of stretch ribbon. It works perfectly and removes are desire for me to do anything else to my album cover. 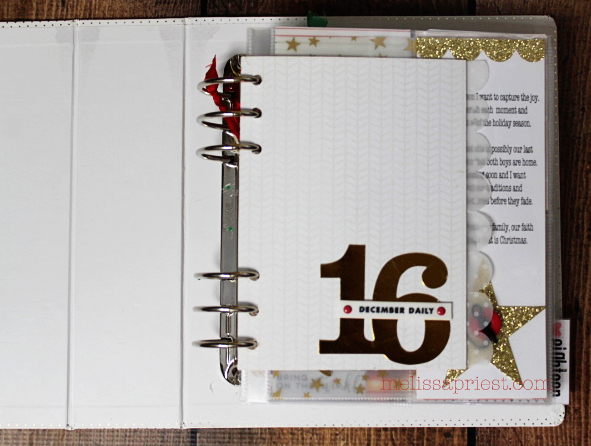 Cover Page - This is actually made of chipboard that has been covered with pattern paper. The scalloped border was cut using my Silhouette machine. The rubber piece is from Ali Edwards. The '16' is hard to see but is actually gold and from Pink Paislee. 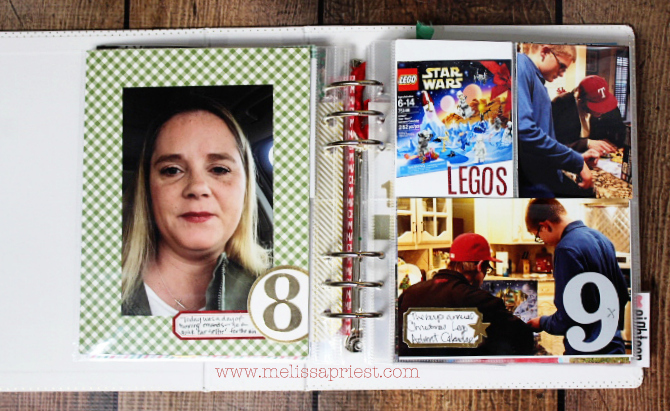 I loved how this page is smaller than the other pages in my album - the varying page sizes gives it some interest. Intentions Page - The word 'Intentions' has been cut on my Silhouette using gold foil then placed on a piece of clear acetate. My actual intention is written on a piece of cardstock that has been attached to a larger vellum sheet. The gold star vellum, button, and gold scallop tape at the top is from my stash. The glittered star is from Ali Edwards. The star vellum is from Michaels, I believe. Day 1 - The day our house lights went up. This is always one of the first tasks of the season for us. The charcoal plaid paper, rubber lights, black alphabet and the striped card are from Felicity Jane. The wood veneer 'Joy' and house are from Elle's Studio, and the 'bring on the twinkle' sticker is from Pink Fresh Studio. Day 2 - We have a tradition of painting a family plate and ornaments every Christmas. We try to get this done early enough that we can have our projects 'fired' and back to us to use for Christmas. 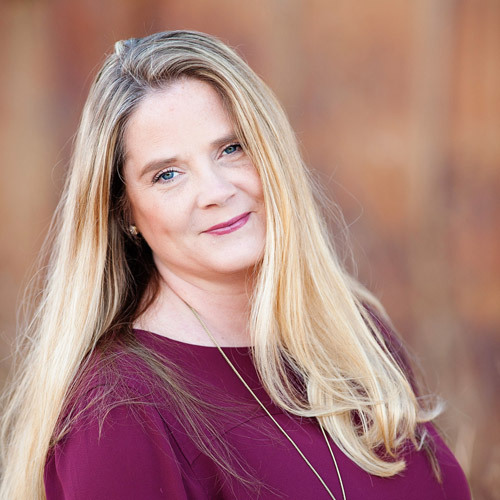 The #2 is from Heidi Swapp. 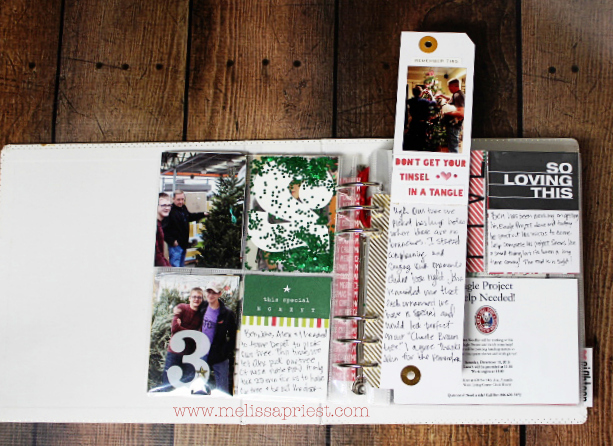 The 'small things' card (its been trimmed and put on heart paper) is from Feed Your Craft. The heart paper is from Illustrated Faith. 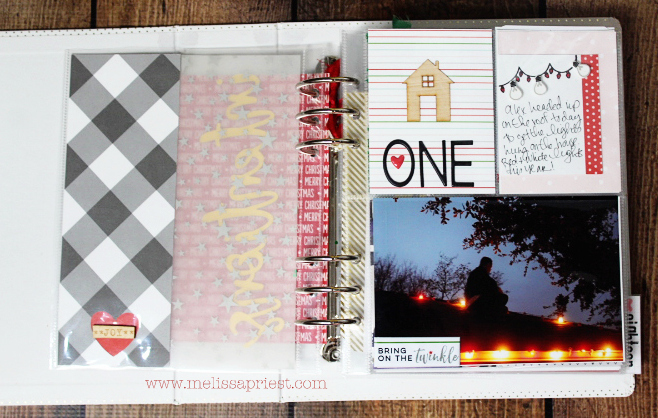 The glitter, red plaid washi, enamel heart and label are random from my stash. The #3 is from Ali Edwards, This Special Memory card is from Elle's Studio. I made day 4 from a tag I had in my stash. 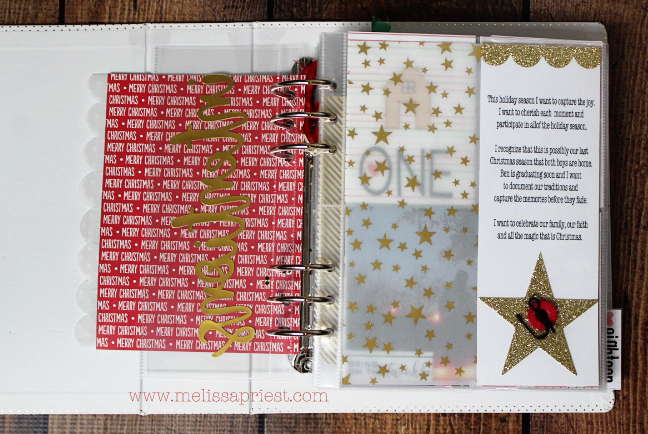 The gold 4 is American Crafts, don't get your tinsel in a tangle is from Doodlebug and the charm is Tim Holtz. The gold striped washi & gold star was from my stash. Day 5 - My son was working on his Eagle Scout project and Day 5 was all about getting volunteers to help him. The black plaid is from Simple Stories and the red stripe pattern paper and black alphabet is from Felicity Jane. The "So Loving This' card is from Ali Edwards. The red scallop is just cardstock that I die cut. I used a silkscreen from Ali Edwards to make the 'wonderful magical...' design. The wooden tree and epoxy heart are from my stash. 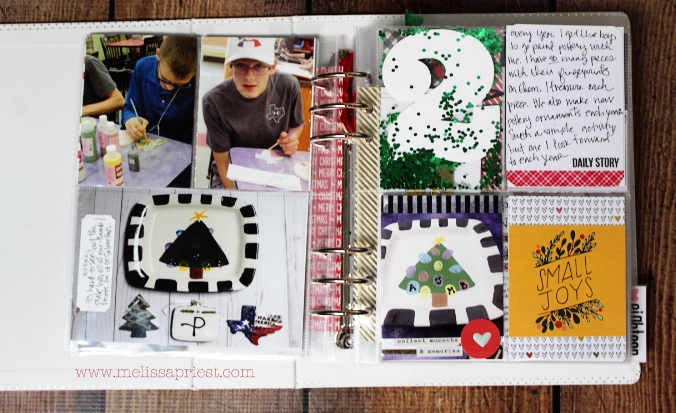 Day 6 & 7 - I participated in an online card swap with my scrapbook friends and today was the day I mailed my cards. All 100 of them. The red snowflake is from Ali Edwards and the gold six is from Pink Paislee. The polka dot card, striped card, get star paper are from Elle's Studio. The red plaid and white & grey word paper is from Ali Edwards. I used my silhouette to cut out 'seven' out of gold foil. Day 8 & 9 - a simple selfie for Day 8. Things were hectic and I forgot to take a photo, so a selfie in the car had to work. Day 9 documented our tradition of opening the Lego Advent Calendar. They had actually opened it on Dec 1 but I only remembered to snap a photo on Day 9. It happens. The green plaid is from Simple Stories, the red tag is from Heidi Swapp, and the acetate #9 is from Ali Edwards. The gold rimmed tags, gold star & number 8 is from my stash. Day 10 - Lots of photos from Day 10. Today was all about my son's Eagle Scout project work day. Absolutely nothing to do with Christmas, but still a huge part of our December Story this year. 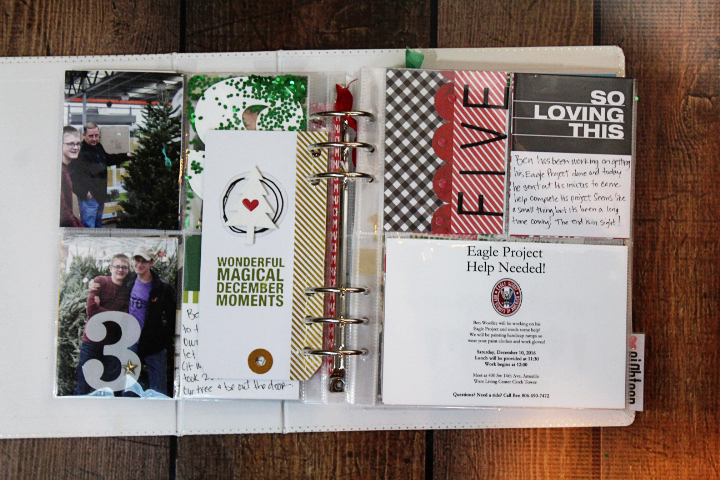 I included a 3x8 insert to add more photos. The acetate #10 and the word sticker are both from Ali Edwards. The gold striped label and gold star are from my stash. Day 11& 12 - Just a silhouette photo of my dog, Annie, in front of the fire for day 11. The gold 11 is from Pink Paislee. The pink heart and 'tis the season tag is from Elle's Studio. 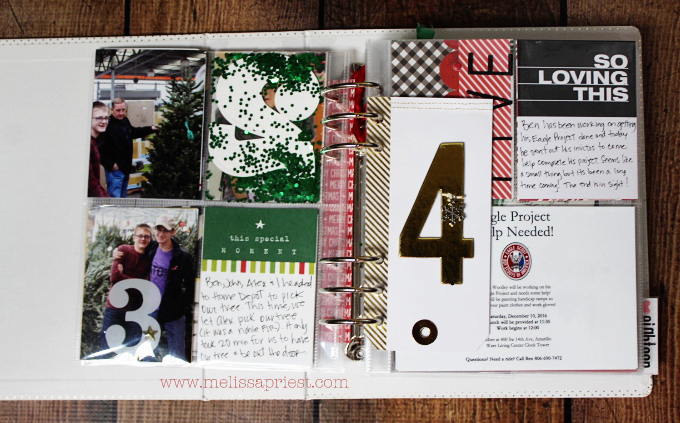 The red plaid card, gold tag, and wood veneer is from my stash. The black and white card is Paislee Press. Day 12 was my birthday. The vellum treat bag actually holds a photo of my cupcake and gift from my husband. You can't see if since I didn't take a photo, but I have journaled on the back on the photo. I used a scallop die to cut the scallop from the bag. The gold tag with the #12 is from my stash, as is the acetate celebrate. The bag was bought off of Etsy. That is a lot of photos + words. Have a question or just want to say hey - leave me a comment. Come back tomorrow for the second half of my album. You can see my 2015 album here and my 2014 album here. I love your album so far. Lot's of great memories captured.